And here is a review of the wonderful creations created by my fellow travelers using these ingredients. I was a bit intimidated by this list of ingredients, the acrylic substrate had me wondering what to do with it and I discovered that I didn't have any Dusty Concord Distress in my stash! 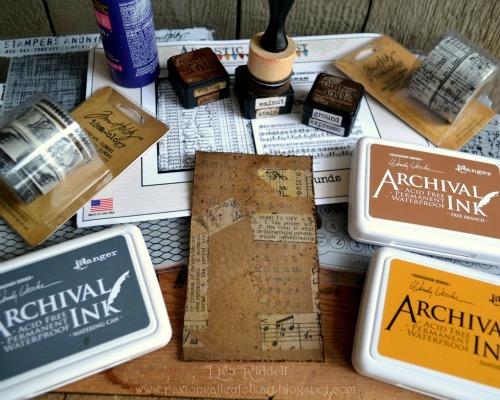 But a quick shopping trip remedied the Dusty Concord conundrum and a new stamp I had purchased and the upcoming Valentine's Day celebrations helped to guide me as I traveled along on this creative journey. 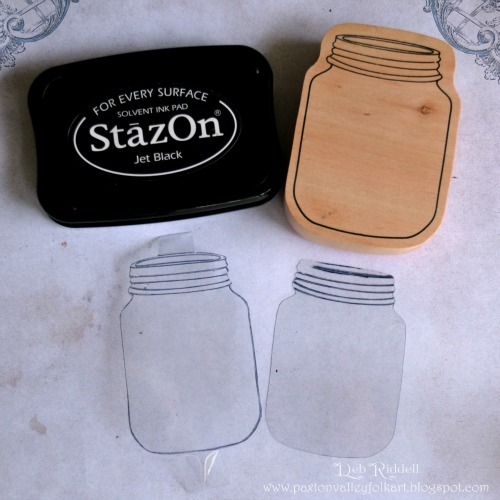 My 'Jar Full Of Love' Valentine's Day card started out by stamping a mason jar stamp twice onto clear waste packaging using Stazon black ink. 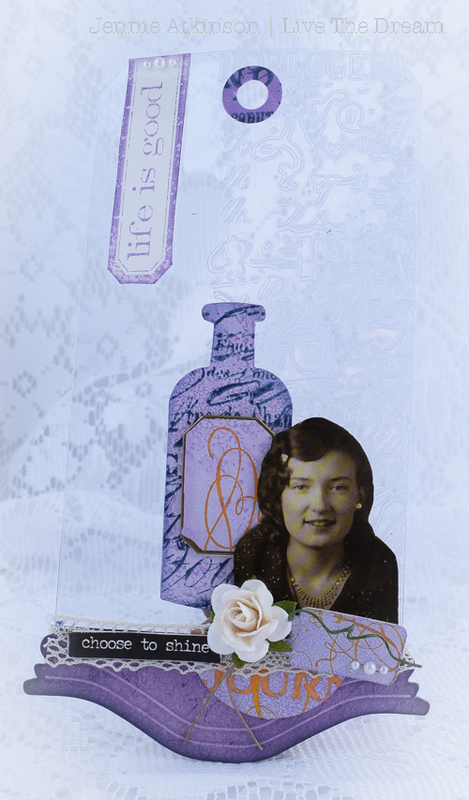 I cut out the jars, cutting one image outside the stamped line and one inside the line, as I planned to layer them one atop the other. Initially I had left a couple of tabs on one of the stamped images but in the end didn't need them and trimmed them off. 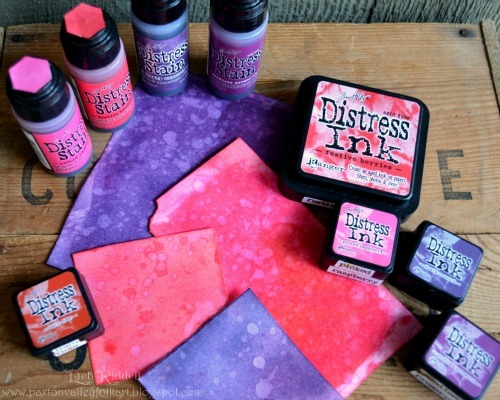 Next, I coloured some manila cardstock with distress inks and stains and some spritz and flick with water. The purple card was coloured with Dusty Concord and Seedless Preserves and the pink card was coloured with Festive Berries, Picked Raspberries and a touch of Barn Red. 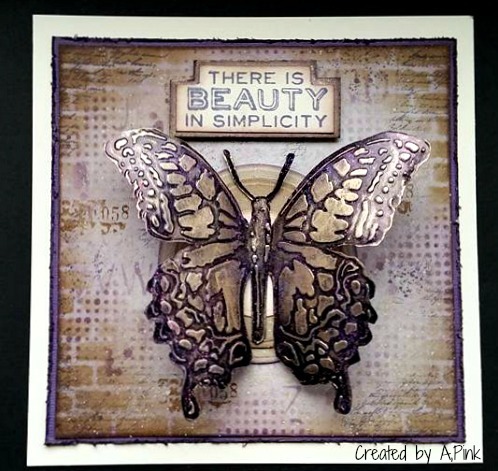 Numerous hearts were then die cut from the cardstock using heart dies by Tim Holtz, Simon Says Stamp and Amy Tangerine. I wanted the mason jar to have some dimension to it, so I laid the top mason jar image over a bottle and gently heated it with my heat gun so it would soften and conform to the curve of the bottle. After getting the shape I wanted, I glued layers of the die cut purple and pink hearts on the inside of the curved mason jar. I added a piece of grey scrapbook paper coloured with Hickory Smoke & Pumice Stone distress ink to the inside of the stamped lid to simulate the zinc lid of a vintage mason jar. 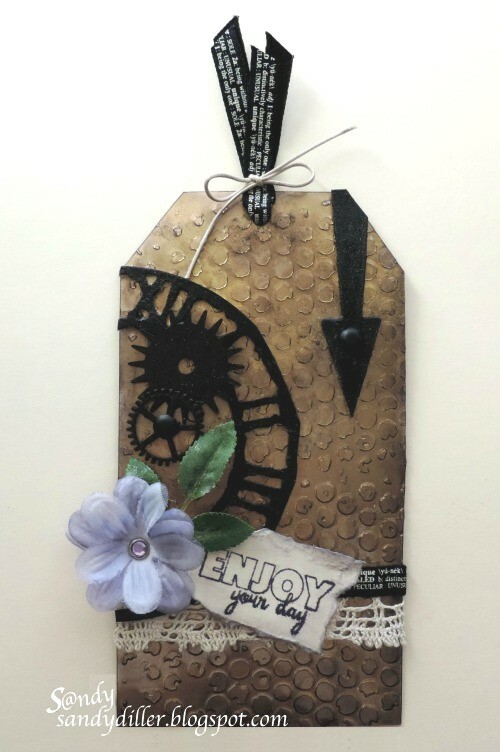 A small hang tag was cut from kraft cardstock with Tim Holtz's Tiny Tabs & Tags die, stamped with the 'XO' and tied onto the jar with a piece of sisal twine. I then layered the curved acrylic mason jar overtop of the flat stamped jar image and glued the two together with some Glossy Accents. I still had to bring the Archival inks into play, so used them to create a background piece to mount my mason jar onto. 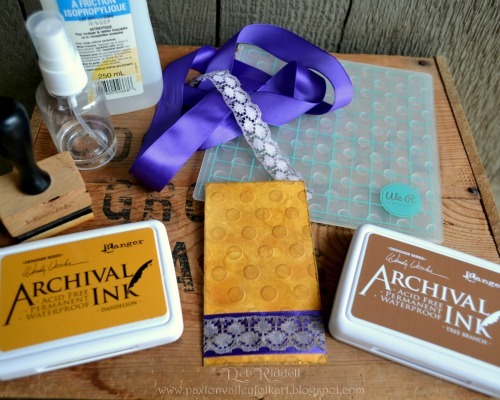 I coloured a piece of manila cardstock with Dandelion and Tree Branch Archival inks by smooshing the ink pads onto my craft sheet and spritzing them with rubbing alcohol and dragging the card through the puddles. 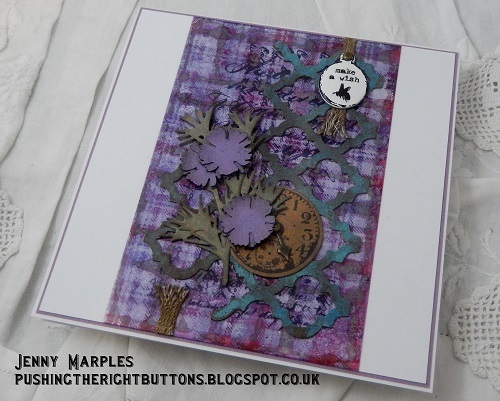 More Dandelion and Tree Branch were added with a foam applicator to darken the colour and then I dripped some rubbing alcohol onto the card for a bit more interest. I embossed the card using a polka dot embossing folder by We R Memory Keepers and highlighted the raised embossed areas with Tree Branch Archival ink. I then added a piece of purple satin ribbon overlaid with an aged piece of lace along the bottom of my panel to give the mason jar a place to sit. One more layer was needed to complete my card, so I took a piece of kraft cardstock, added strips of Tim Holtz Tissue Tape and stamped multiple background images with Dandelion, Tree Branch and Watering Can Archival inks. I added some Walnut Stain and Ground Espresso distress inks along with some spritz and flick with water to finish it off. I cut a piece to fit on my card blank and distressed the edges with a Tonic Distressor tool and some Ground Espresso Distress ink and did the same for the yellow embossed panel. The sentiment was stamped onto some more kraft cardstock with Jet Black Archival ink and heat embossed with clear embossing powder. I backed it with a fragment of the yellow embossed card, fussy cut it and then aged it with a bit of Ground Espresso Distress ink. 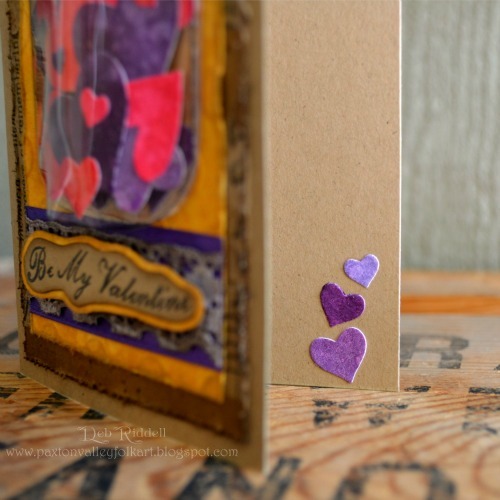 All the components were then layered onto a kraft card blank and I added a few more Dusty Concord hearts to the inside to complete my Valentine's Day card. I hope you have enjoyed the journey that the Creative Guides have taken you on this month as we explored where the contents of our travel bags could take us, as you can see they took us all in very different and wonderful directions! Make sure to stop back again next Monday when we will be embarking upon a new Destination Inspiration voyage and also be sure to come back this Friday when we will be debuting our February challenge theme. I promise you that you will not be disappointed! And speaking of challenges, you still have a few days left to join in this months challenge, Vintage Travel and Luggage, so hope to see your wonderful creations linked up there. Thank you for stopping by today and happy creating! Wow Deb that is so cool. 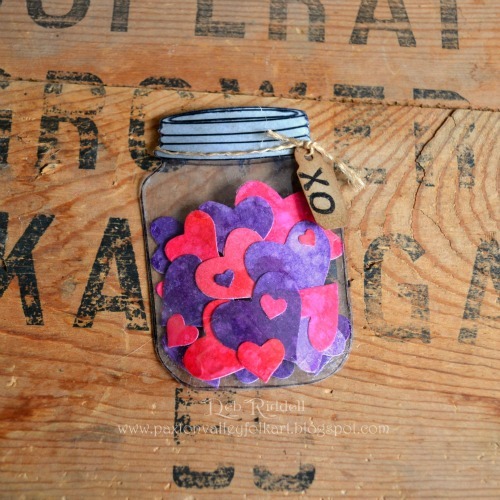 A beautiful jar of hearts, cleverly designed and with great use of the waste packaging. 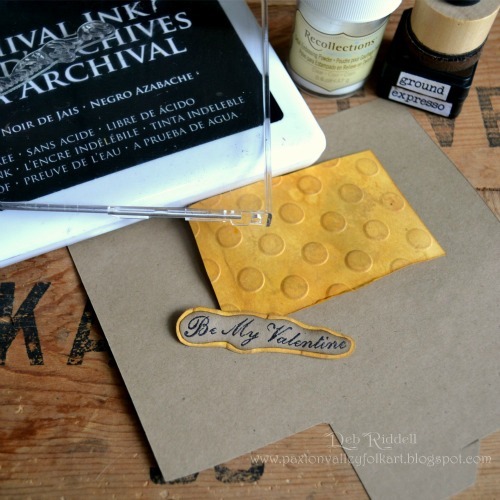 I love the vibrant hearts and the more moody archival ink background, they are a great contrast and the little zinc lid looks amazing. A beautiful finale to this months DI stops. Brilliantly done Deb, absolutely no need to be intimidated... The contrast between the background and that super clever little jar is brilliant, such an original idea to put those little hearts inside! Another months of fantastic DIs!! What an inspired use of the contents of your travel bag, Deb! 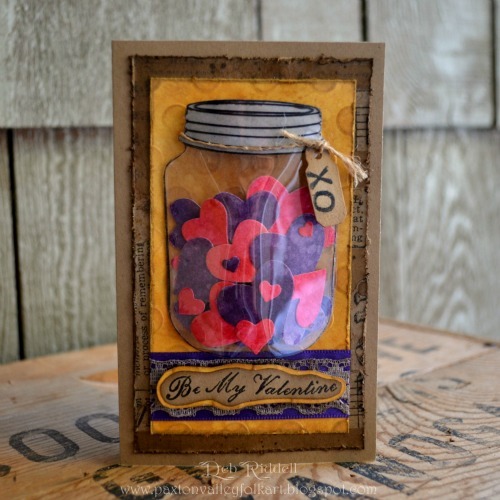 I love your little hearts and they look great inside the brilliant acetate jar. Fabulous use of contrasting and earthy colours as you layered up the background layers too - a fantastic finale to another great month of Destination Inspiration. What a wonderful way to use the contents of the travel bag Debs. Love how you have made a little 'jar full of love' and such a clever way of shaping the jar too .Great tip . The earthy tones of the backgrounds are lovely too . Its been a great month of Destination Inspiration . Wonderful creations. Especially like how you used the heat tool to give wonderful realistic look to your jar. Have a BEE-utiful day! Wonderful - wonderful - wonderful -- a jar full of hearts -- Godiva Hearts I am sure. With all of you talented ladies telling us how to do things - you would think I would learn some of it. The jar could be full of anything - the sky is the limit - from snow balls to pickled pigs' feet. Don't laugh, my grandfather kept a big ole' jar (and it was big too) of pickled pigs' feet on the kitchen counter all the time. I love your card - the colors - the layers - your fantastic jar and of course the hearts.